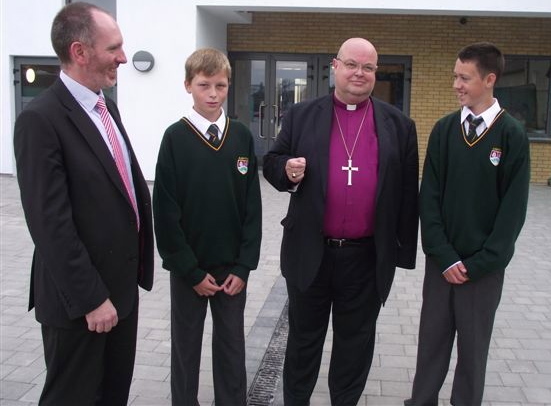 Today, Wednesday, 28th August, Bishop Paul Colton, visited Ashton Comprehensive School, Cork (of which he is co-patron with the Cork Education and Training Board) as a new school building opened to the entire school for the new academic year. 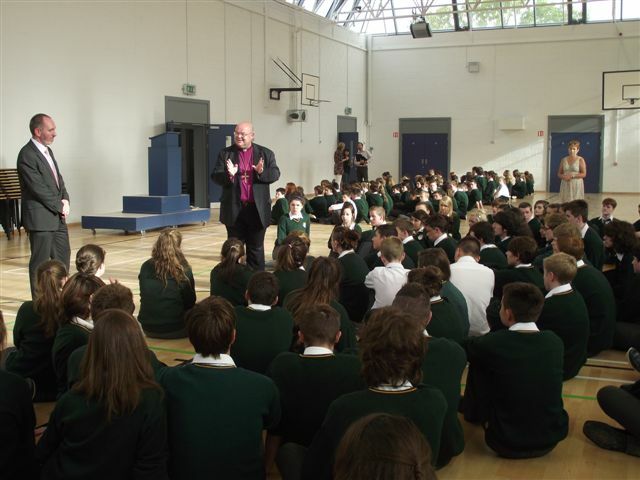 The Bishop gives a word of encouragement after assembly to new fifth years at Ashton. The Bishop spoke at assembly and referred to the Book of Ecclesiastes: ‘there is a time to tear down and a time to build.’ As he was speaking, coincidentally but symbolically, the demolition of the final part of the old school building near by took place. Afterwards Dr Colton spoke to the fifth year students as they start senior cycle and also the new first years as they start their journey at the school. Ashton School Principal, Adrian Landen (left) and the Bishop chat with two First Years, both of whom are grandsons of teachers who taught the Bishop during his years at Ashton. This entry was posted in Bishop, Schools in the Diocese. Bookmark the permalink.